Alyscamps is an ancient burial site and early Christian cemetery, along the terminal segment of the Aurelian Way from Rome. Alyscamps is an ancient burial site and early Christian cemetery, along the terminal segment of the Aurelian Way from Rome. One of the most famous necropolises in the world, it is part of the UNESCO World Heritage Site of Roman and Romanesque monuments in Arles. 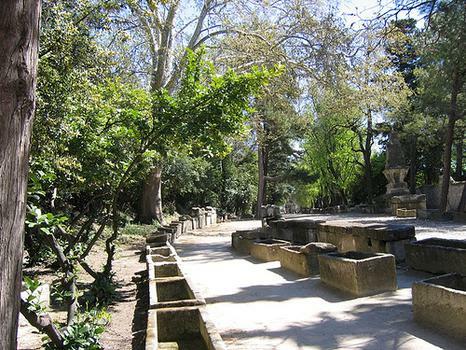 As the city's main burial ground, it had several stone sarcophagi and elaborate memorials of the wealthy, some of which can now be seen in the Musée de l'Arles et de la Provence antiques. Saints Genesius and Trophimus were among those buried here. The medieval Church of Saint Honoratus is at the south-east corner of the cemetery. Van Gogh and Paul Gaugin were both inspired by the landscape in Alyscamps to base some of their paintings here. Van Gogh painted the lane with tall poplars and sarcophagi in his Les Alyscamps pair of paintings, and createdanother pair of paintings entitled 'Falling Autumn Leaves' here. Gaugin chose to focus on the remarkable scenery in his Les Alyscamps.